Welcome to the latest edition of the Inclusive Growth Bulletin! Let’s navigate the month of March together with a new publication on social protection in the Middle East and North Africa (MENA) region and studies on fiscal justice and tax reform in Brazil. We start out with the Research Report: “Building Shock-Responsive National Social Protection Systems in the MENA Region.” The author Raquel Tebaldi (IPC-IG) aims to provide a general assessment of opportunities and challenges for shock-responsive social protection in the Middle East and North Africa region. It is available as a free download in English, in PDF and smartphone/tablet-friendly formats. A companion One Pager is available in Arabic, English, French and Portuguese. 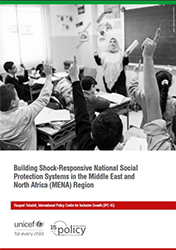 This Research Report was produced under the scope of the research project to support social protection knowledge production and policy analysis in the MENA region, carried out by the IPC-IG and the UNICEF MENARO. The following knowledge products have been released under the same project: “Children’s Right to Social Protection in the MENA Region—an Analysis of Legal Frameworks from a Child Rights Perspective”; "Overview of non-contributory social protection programmes in the MENA region though a child and equity lens'; and the One Pager series: "Overview of non-contributory social protection programmes in 20 countries of the MENA regions though a child and equity lens. Find them all here, sorted by language: Arabic, English, French and Portuguese. In the Working Paper “Perspectives on tax reform in Brazil”, Marc Morgan (World Inequality Lab, Paris School of Economics and L’Ecole des Hautes Etudes en Sciences Sociales) seeks to examine the design of a tax system that would better serve the principles of equity and efficiency for the country and to make it a global leader in progressive tax policy. The study is available in English, and a A companion One Pager is available in English and in Portuguese. In the Working Paper “Fiscal justice in Brazil: pathways to progress”, the authors Luana Passos (Universidade Federal Fluminense, UFF), Dyeggo Rocha Guedes (Universidade Federal do Sul e Sudeste do Pará, UNIFESSPA, and Universidade Federal do Rio Grande do Sul, UFRGS) and Fernando Gaiger Silveira (Institute for Applied Economic Research, Ipea) try to clarify the debate around the importance of fiscal justice in the promotion of equity and possible pathways to achieve this laudable goal. The study is available in English, and a companion One Pager is available in English and in Portuguese. Interested in submitting a study to the IPC-IG for publication? Check out our guidelines for authors here. Our colleagues and partners at the socialprotection.org platform are hosting the webinar “Strengthening capacity to design and implement risk-informed and shock-responsive social protection systems in ASEAN”, on 21 March. The webinar is being organised by Oxford Policy Management and World Food Programme. Register for free here. In tune with the celebrations of International Women's Day, on 8 March, the platform hosted a series of webinars related to gender topics: “Realising rights: how can social protection advance gender equality?”, organised by the Overseas Development Institute (ODI), Gender and Development Network, and the UK Department for International Development (DFID); “Social Protection Systems for Gender Equality”, a webinar in preparation for the UN Commission on the Status of Women", organised by the EU Social Protection Systems Programme; and “The politics of gender-responsive social protection”, by ODI and DFID. Additionally, some of the sessions of the sixty-third session of the Commission on the Status of Women (CSW), held in New York from 11 to 22 March, were livestreamed through socialprotection.org. socialprotection.org is hosted and developed by the IPC-IG. The IPC-IG was honoured to participate in the “IV International Seminar Investment in Children in Latin America and the Caribbean: A Strategy to Accelerate the Achievement of the Sustainable Development Goals” ( Seminário Internacional Inversión en la Infancia en América Latina y el Caribe: una estratégia para acelerar el logro de los ODSs), organised by the Government of the Dominican Republic and UNICEF, in Santo Domingo, on 13 and 14 March. Our Senior Research Coordinator and Researcher at the Institute for Applied Economic Research (Ipea), Sergei Soares, delivered a compelling presentation titled "Towards a Universal Child Benefit in Brazil: What Needs to be Done and What can be Expected?". Read more about it here. Celebrating the 2019 International Women's Day (IWD), the IPC-IG has curated a special selection of articles dedicated to women’s empowerment, social protection, gender equality and the participation of women in the labour market. Read them here. IPC-IG's Senior Research Coordinator Fábio Veras and Researcher Carolina Bloch participated in the UNICEF’s Middle-Eastern and North Africa Social Policy Network Meeting, held in Amman, from 10 to 12 March. They presented an overview of the work that the Centre has been developing under a project agreement with UNICEF MENARO, which includes a series of studies on child-sensitive social protection. The project also has a policy support component based on the demand of UNICEF Country Offices in the MENA region. Dr. Veras also travelled to Kenya to participate in two consultation workshops, held in the cities of Naivasha and Nakuru, from 18 to 28 February. The mission was organised under the scope of a capacity-strengthening project between the Centre, UNICEF and Government of Kenya, to support the Kenyan Social Protection Secretariat in revising the country's National Social Protection Policy (NSPP). During the workshop, a draft version of the document was discussed by the different stakeholders involved in the process.